Geek Deal of the Day! 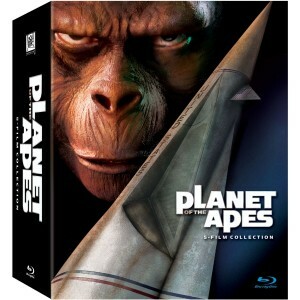 ‘Planet of the Apes Movie Collection Blu-ray! Only $22.99!!! Your geek deal of the day is AMAZING. The ‘Planet of the Apes’ 5 film collection is on sale over at Amazon for 54% off right now, bringing the total down to $22.99, the cheapest it has ever been. This could make a great gift for the holidays or sit perfectly in your blu-ray collection at home if you don’t already have this. I own this, and I’ve watched this set over 10 times. I love these films. 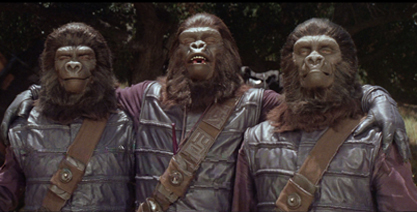 A bewildered astronaut (Charlton Heston) crash-lands on a strange planet ruled by apes who use a primitive race of humans for experimentation and sport. A daring rescue mission leads to a subterranean city where mutant humans worship a weapon capable of destroying the entire planet. Two futuristic simians who have traveled to present-day Earth enjoy celebrity status—until a government plot forces them to run for their lives! Apes have been domesticated and trained as pets and personal servants — until their continual mistreatment leads to a spectacular revolt. In the final Apes chapter, an idyllic society of man and ape is threatened by both a militant gorilla and a tribe of still-intelligent mutant humans. PLANET OF THE APES: Science of the Apes BONUSVIEW,* Beyond the Forbidden Zone Adventure Game, Public Service Announcement from ANSA, Evolution of the Apes Featurette, Impact of the Apes Featurette, Behind the Planet of the Apes Documentary with Interactive Mode, Audio Commentaries, Text Commentary, Original Makeup Test, Roddy McDowall’s On-Set Footage, Dailies & Outtakes, NATO Presentation, Vintage 1968 Featurette, Theatrical Trailers, Still Galleries & More! BENEATH THE PLANET OF THE APES: Isolated Score Track, From Alpha to Omega: Building a Sequel Featurette, Theatrical Trailer, Still Galleries & More! ESCAPE FROM THE PLANET OF THE APES: Isolated Score Track, The Secret Behind Escape Featurette, Don Taylor Directs Escape From the Planet of the Apes Vintage Featurette, Theatrical Trailer, Still Galleries & More! CONQUEST OF THE PLANET OF THE APES: Unrated and Theatrical Versions, Isolated Score Track, Riots & Revolutions: Confronting the Times Featurette, A Look Behind the Planet of the Apes Vintage Featurette, J. Lee Thompson Directs Conquest of the Planet of the Apes Vintage Featurette, Theatrical Trailer, Still Galleries & More! BATTLE FOR THE PLANET OF THE APES: Extended and Theatrical Versions, Isolated Score Track, End of an Epic: The Final Battle Featurette, Theatrical Trailer, Still Galleries & More! Special Features Are Unrated, May Not Be High Definition, And Are Not Closed Captioned. *BONUSVIEW-enabled player required. This entry was posted on Sunday, November 18th, 2012 at 12:26 pm	and is filed under Film, News. You can follow any responses to this entry through the RSS 2.0 feed. You can skip to the end and leave a response. Pinging is currently not allowed. « Check Out the Amazing ‘Hitman Absolution’ Trailer!! !